Meet Artwork Archive artist Anne Kullaf. A painter of visually-engaging still lifes and landscapes, Anne seeks to illustrate more than what meets the eye. 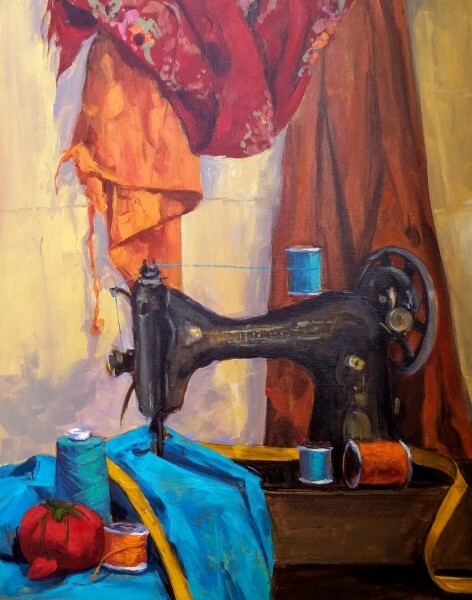 Her dynamic style captivates viewers to look twice at ordinary scenes and objects. This passion drives her work, and in turn fuels her prominent teaching career and popular social media accounts. 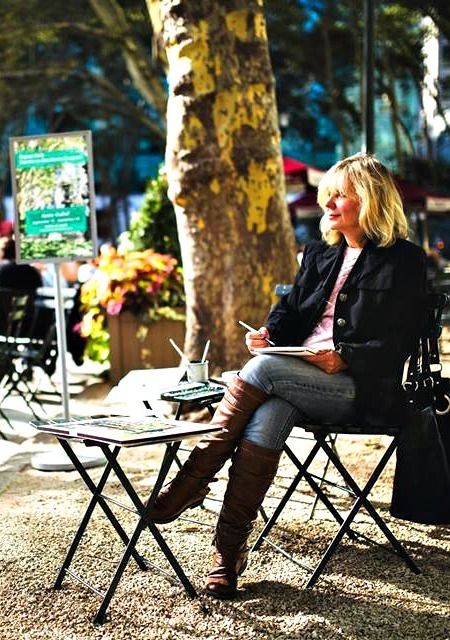 From promoting last minute openings for her workshops to demonstrations of her techniques, Anne expertly reveals how teaching and social media all complement an art business strategy. Believing that selling work is only the start, she shares her social media marketing tips and what she teaches her students about being an artist outside the classroom. Want to see more of Anne’s artwork? Visit her Public Page. Step inside (and outside) the artist’s studio. 1. 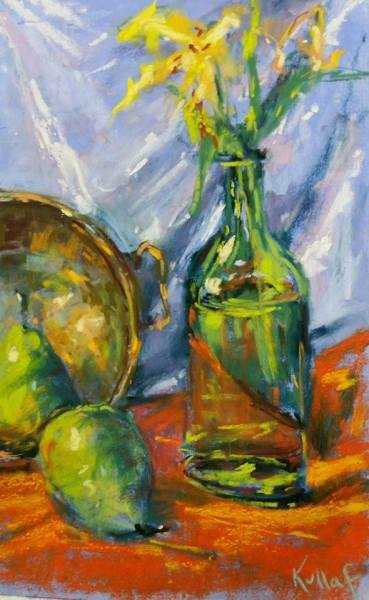 YOUR WORK PRIMARILY FEATURES STILL LIFES AND LANDSCAPES. WHAT INSPIRES YOU ABOUT THESE SUBJECTS AND HOW DID YOU COME TO FOCUS ON THEM? I find things visually interesting that might not have visual meaning. I look at the world through an abstract view. I work the same way, no matter the subject. 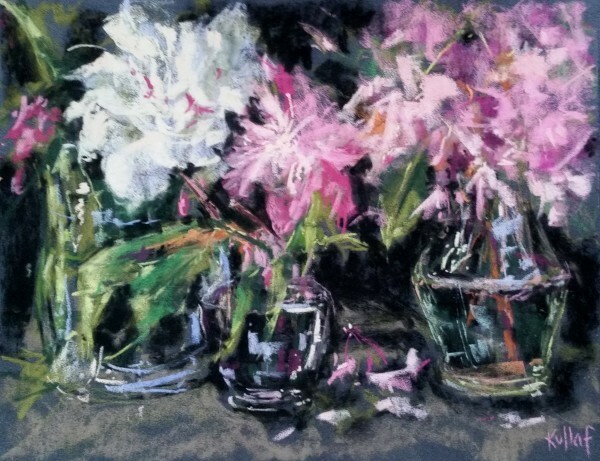 Since I prefer to paint from life rather than from photos, I often choose still life as a subject. 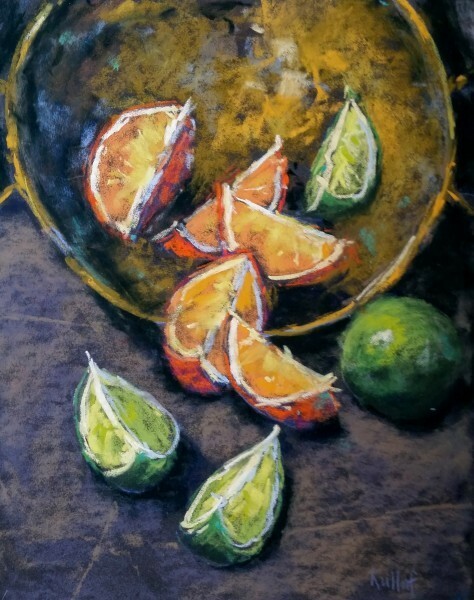 I also use still life as a means of teaching my students about the importance of direct observation (working from life) as a means of developing a trained eye. I’m looking to see what I can get from each subject, not simply what it is. I want to create something that’s compelling to look at; something that’s spontaneous, lively, and that makes the eye move around a lot. I want the viewer to look at it more than once. I want my work to show more than what’s there. I’ve painted since I was a child, majored in art in college, and always looked at things purely from a visual standpoint. I look for interesting shapes, lighting, and anything that makes me want to look at the subject a second time. Those are the things I paint. They may not be unique or necessarily beautiful, but I try to show what I see about them that makes them unique to me. 2. YOU WORK IN A VARIETY OF MEDIA (WATERCOLOR, PASTEL, ACRYLIC, OIL, ETC.) WHICH ALLOWS YOU TO MAKE ART THAT’S BOTH REALISTIC AND IMPRESSIONISTIC. WHICH MEDIUM DO YOU MOST ENJOY USING AND WHY? I like all the mediums for different applications and for different reasons. I like watercolor when it comes to expression. I like to represent the subject correctly, then put color, texture, and brushstrokes to work to take it to the next level. Watercolor is so unpredictable and so fluid. I like to look at it as a series of reactions as I put each stroke down. Unlike most watercolor artists, I don’t draw my subject with a pencil first. I move the paint around to the create the images that I want. 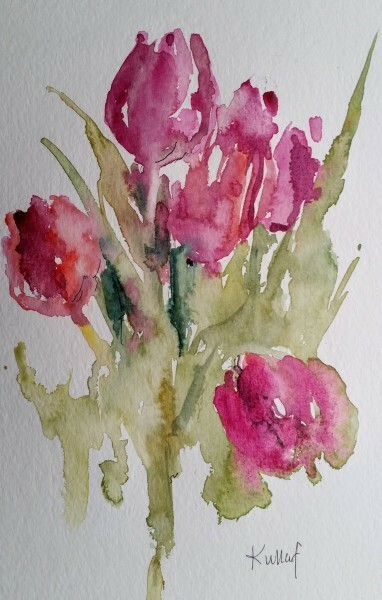 I don’t use a watercolor technique either, I draw with my brush–sometimes monochromatically, sometimes with color. It’s about getting the drawing of the subject on paper, yet at the same time, paying attention to what the medium is doing. The way you put the paint onto the canvas or paper is as important, if not more important, than whatever the subject is. I think an artist should start with a great structure in terms of a solid drawing and composition, but they need to bring more to the table and show the viewer how to perceive the subject. What makes something unique, what makes you want to look at it, is intangible. It’s more in the gesture and moment rather than small, minute, details. It’s the whole idea of spontaneity, light, and vibrancy that I want to permeate my work. 3. HOW WOULD YOU DESCRIBE YOUR METHODS AS AN ARTIST? DO YOU PREFER WORKING IN YOUR STUDIO OR BEING OUTSIDE? My preference is always to work from life whenever possible. If I'm inside I will set up a still life. 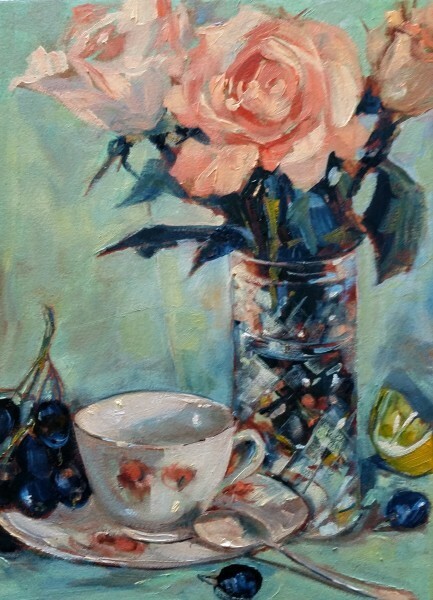 I absolutely paint still lifes from life because you see more. It’s more challenging and it trains the eye to see what you’re looking at. The more you paint from life, the more depth you’ll attain and you’ll be a better draftsman. I love working on location whenever possible because I like to work outdoors. If I’m indoors, I typically sketch my piece from studies done on location in conjunction with some very quick photos. But, I rely more on studies than photographs–photos are just a departure point. They’re flat and there’s no sense of being there. I can’t be on location when I work on a large piece, but I’ll sketch in my sketchbook–I like watercolors for location sketches–and take those back to my studio. Painting from life is so important, particularly for people just starting to paint. If you paint for a long time, you have enough experience to take a photo and make it into something more. A beginner artist is going to go for a copy. I discourage working from photos and think artists need to take the word “copy” out of their vocabulary. Photographs are simply a place to start. 4. WHAT MEMORABLE RESPONSES HAVE YOU HAD TO YOUR ARTWORK? 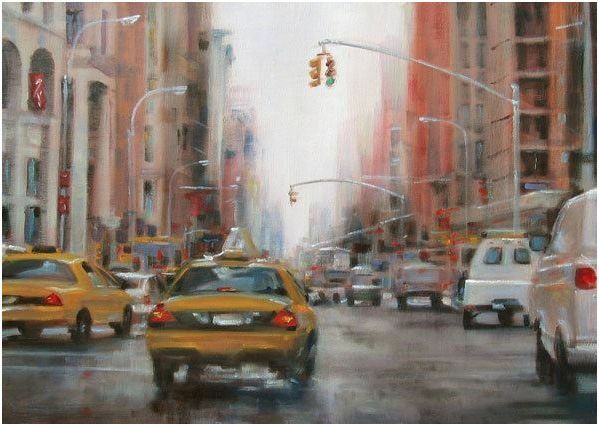 I often hear people say, “Wow, that’s so alive, so vibrant, there’s a real energy from it.” For my urban landscapes, people say, “I could step right into the painting.” Those type of responses make me really happy to hear. That is really what I want my work to say. The subjects are very alive and have energy–the viewer should want to explore it. I don’t want my work to appear static, I don’t want it to look like a photo. I want to hear that it has “so much movement.” If you step away from it, it forms the image. If you’re close up, it is a mix of colors. When you have the values and color in the right places, that’s where the magic happens. That’s what painting is. You’ll want to get your notebook and pencil at the ready for these smart art business tips (or your bookmarking button). 5. YOU HAVE A GREAT BLOG, OVER 1,000 INSTAGRAM FOLLOWERS, AND OVER 3,500 FACEBOOK FANS. WHAT INFLUENCES YOUR POSTS EACH WEEK AND HOW HAS SOCIAL MEDIA HELPED GROW YOUR ART BUSINESS? I don’t separate my teaching from my art business. I look at it as a component of what I do. Part of my income comes from courses and workshops, the other part comes from paintings. It’s the combination that makes up my art business. I use social media to build awareness of my work, get people familiar with it, and to attract prospective students. When I need one or two more people to fill up my workshops, I post on Facebook. I typically get people to join because I post about the subjects taught in the class. I also have people who are prospective collectors come to exhibits, so I target my posts to my region and people attend. It draws people whom I don’t know to shows in my area, and certainly helps with raising awareness for my work. I have so many social media posts because every time I do a demo I post it. That gives other artists and prospective students an idea of what I teach, how I approach subjects, and how much work goes into becoming proficient. Lots of people who are starting out can’t wait to get to the level where they know what they’re doing. They ask when they’ll be ready for a gallery show. It takes lots of time and an ongoing effort to build a body of work before considering gallery shows. I how much work and effort it really takes. I also put content out there that is educational to other artists who are trying to get to the next level. It points them in the right direction and sparks interest to work with me in a future class. I keep my blog posts authentic and positive–that’s really important to me. There are lots of things out there that aren't essential to artists who are starting out, so I want to provide those artists with the basics. 6. YOU ARE A FACULTY MEMBER OF THE VISUAL ARTS CENTER OF NEW JERSEY, THE HUNTERDON MUSEUM OF ART, AND THE CENTER FOR CONTEMPORARY ART. HOW DOES THIS FIT WITHIN YOUR ART BUSINESS? I’m always doing demos and view teaching as part of my art business. Some of my best paintings are from demos when I’m teaching students. I love demonstrating. I’m interested in providing students with skillsets they can take to use on their own. You get more out of a class when the focus is on learning rather than individual studio time. I use my own work as examples. I take students on the journey with me. I start every class with a demo. I always have a concept that I emphasize in the demo, such as complementary colors, perspective, or composition. 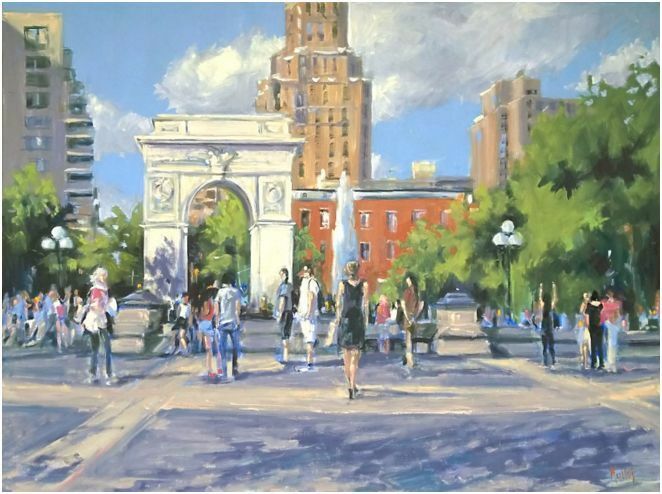 I also teach a lot of plein air workshops, so I’ll combine a workshop with a few days painting. I'm teaching a pastel and watercolor on location in Aspen this summer. I will be using studies when I get back for bigger projects. I can talk and paint at the same time, it truly doesn't phase me. I think some people have trouble with that. It’s important to have a point to your demo. Talk about that and have it in the back of your mind to stay focused. Make sure that it is a very salient point in what you’re doing. Obviously if I’m working on a commission I won't do it in class. I have done portions of larger works in class and done small pieces for sale. If you’re going to teach you should be able to do that. Students who are studying art are visual learners. 7. WHAT IS YOUR PHILOSOPHY AS A TEACHER AND WHAT IS THE NUMBER ONE LESSON YOU WANT YOUR STUDENTS TO REMEMBER? Be authentic. Don’t try to be anyone other than yourself. If you have something that’s a strong point, make the most of it. If there are areas you’re weak in, address them. 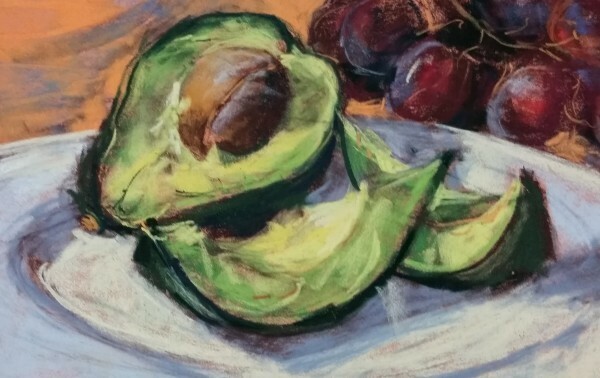 Take a drawing class or a color mixing workshop. Own up to the fact that you need to address your weaknesses and do the best you can with them. Remain true to whatever excites you. I love to draw and I love abstract painting, but I don’t see myself ever evolving into a pure abstractionist because I love to draw too much. It’s an important component to me as an artist. Don’t decide you’re going to paint in a more realistic manner to generate sales if that’s not what you want to do. Paint what compels you and excites you the most. Anything less than that is not your best work. Address your weaknesses and build upon your strengths. Go after what really excites you and get good at it. Don’t change to please the market since you’ll never please everyone. That’s the reason I don’t do many commissions. I don’t want to be painting another person’s painting and put my name on it. If you’re not interested in painting something, don’t do it. It’s better to walk away from it than run the risk of ruining your reputation as an artist. Want to learn more from Anne Kullaf? Check out her blog and her wonderful review of Artwork Archive. Are Trade Shows Right For Your Art Business? Looking for new ways to get noticed by art buyers, galleries, and retail shops? Trade shows could be your next big break. Questions about using an art inventory management system? Not sure how it will help your art business? We have the answers.